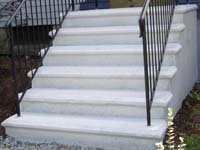 W&D Enterprises manufactures, delivers and installs high quality precast concrete steps and concrete bulkheads in the MA & RI area. Concrete used for steps in residential or commercial applications is nothing new, though stamped concrete steps, with its many colors and designs, haven't been used as often. Check and compare. 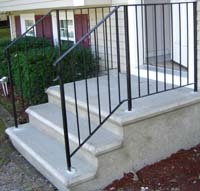 Our precision-cast, quality concrete stairs will cost you less than on-the-job pouring. Steps are delivered, installed and ready to use in one hour. Save time and money. 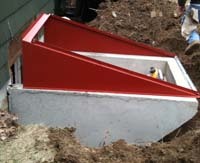 Our reinforced precast concrete steps and bulkheads are properly cured before installation. Proper curing is essential to the strength and longevity of concrete. This means there's no additional work required on your end to ensure your stairs cure correctly. No forms to be set or cement trucks on your front lawn, your steps are useable in an hour. Caution: Salt, calcium chloride and other chemicals are harmful to all concrete surfaces. W&D Enterprises is a family owned and operated company which has been serving Massachusetts and Rhode Island for 40 years.